That there was a church at Titchwell at the end of the eleventh century is evidenced by Domesday, and much of the existing building dates from about that time. 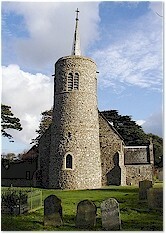 The tower is an interesting example of the many East Anglian eleventh century round towers. visit The Round Tower Churches Society for further information. 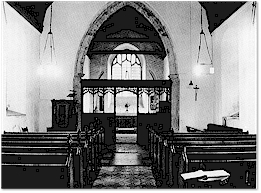 Although Titchwell Church attained its present plan during the 15th century, repairs were carried out in 1844 and again in 1859, but in 1890 came a thorough restoration of the whole building. From the west wall of the nave on either side of the tower on the outside it can be seen that the original eleventh-century church was much narrower, consisting probably of a nave and chancel in just a simple rectangle. In the 15th century, however, there was a fairly extensive reconstruction, bringing this simple little church building into line with the prevailing 'Perpendicular' style. The nave was enlarged to its present width and the old 13th century south door which had been inserted into the earlier building, was rebuilt in its present position. A south porch was added, tall windows provided in the nave and similar windows, with Perpendicular tracery, took the place of the 11th century ones in the chancel. The increased width of the nave allowed for the insertion of the chancel arch, into which was fitted the rood screen - only the upper portion remains, the lower part being modern - and the 15th century arches by which the rood loft was approached remain in the north wall. The position of the rood stair turret is still visible against the wall on the outside. 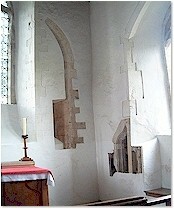 The head of a stone coffin is on the floor against the north wall of the chancel inside the church. There are no markings and the reason for it being there has long been forgotten. A further restoration in 1902 uncovered older features in the walls which had been plastered over for centuries and this enables one to glimpse at the surviving fragments and to imagine this church in much earlier times. There are interesting uncovered remains in the chancel of two 11th century round-headed windows with deep splays in the east wall. One can be seen in the photo on the left. There were probably three of these in the east wall, the centre one having been replaced by the existing east window in the 15th century. The chancel piscina was ogee headed and very fine with cusping and a large drain for washing the chalice, but it was spoilt by the addition of a larger window adjacent to it. This can also be seen in the photo above. The old 11th century 'tub' font below had been serving the purpose of drinking-trough in a field outside. It was restored to its proper use and given a new base in 1890. Before the restoration of the Norman font the pedestal font, now standing in the north corner of the chancel, had been used. This font was originally in Burnham Deepdale Church at the time when its famous 'Seasonal' font was alienated from the church, but on its recovery and restoration, this 18th century font was passed to Titchwell Church by the Rector of Deepdale. There are five stained glass windows in the church. On the south wall of the nave a large window (right) forms a nice set of Bible scenes. The much smaller west window in the tower is a Victorian insertion, attempting to use a Norman style. Its stained glass of 1897 shows, appropriately for this farming village, an image of; 'The Sower', seen on the right. 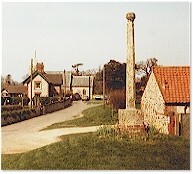 Anyone visiting Titchwell will see the village cross beside the main road looking down past the church to the marsh. The origins of this ancient cross are unknown but it is thought that it might originally have been a preaching place and later used as a meeting or market place. 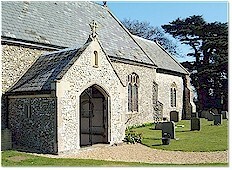 There are similar crosses in some other Norfolk parishes. 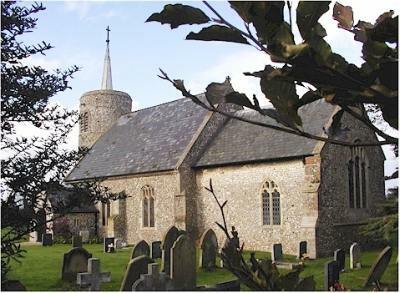 After the retirement of the last Rector of Titchwell in 1925, the benefice of Titchwell was united for nearly fifty years with that of Thornham, but in 1974 Titchwell was placed in the charge of the Rector of Brancaster and is now part of the united Saxon Shore Benefice. Two services are held monthly in this small parish on the 2nd and 4th sundays at 8am. These services use the Book of Common Prayer 1662 Holy Communion and consequently, many people attend from other parishes. The population of the hamlet of Titchwell is c.100. The Church Registers are complete from 1558 and are in good condition, but from 1558 to 1598 they are, as is so often the case, a copy of the original. On the back of the parchment cover at the beginning of the first volume are notes concerning the deaths in 1464 and 1488 of Simon Miller and his son John, who were wealthy merchants in the district and the restorers of the church in the neighbouring parish of Thornham. On the first page of this first Register Book is an interesting List of Briefs published at Titchwell in the 16th and 17th centuries. These registers can now be seen in the County Archives in Norwich. Church Tours Committee 1984 and Round Towered Churches in Norfolk, 2001.